This boltless Metal Point 2 shelving unit is available with stackable bins of different sizes for storing small-sized products. They include a space on the front for labels, which facilitates the rapid location of each item. The various available options include the ideal number of bins to maximize the available surface. 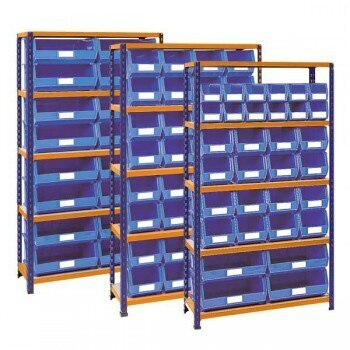 The unit includes 5 load levels with particle board shelves, and it is possible to choose between 8 to 32 blue boxes. Pre-packaged kits complete with shelving and bins. Easy to order, no calculations needed. All shelves and bins are easily accessible. Other sizes or combinations are available to customize your unit. Containers are made out of high-quality polypropylene and are resistant to blows, acids, and chemical compounds. Boxes/Bins Quantity: 8, 12, 16, 32.